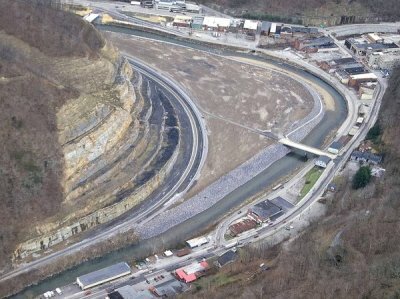 Unique new $200 Million Taxpayer Funded Wal-Mart Opens in Grundy, Va.
One of the most asinine examples of the waste of public money has finally opened in Grundy. After spending $200 million and 15 years in a town of 1000 people, while watching the Buchanan County population drop 10.7 percent, we get a Wal-Mart. The project was four years late and the old businesses that were paid millions by VDOT to raze their rotting structures aren't coming back. The associated retail space remains empty as of September 2015 and the population continues its decline. To further quote the giddy press, "When it comes to traffic counts, this Wal-Mart is on top of the situation...literally. This super center is the only Wal-Mart in America sitting on top of a two-story parking garage." The cost of this nonsense could have sent most of the County residents to a four-year college. The median income for a household in the county was $22,213, and the median income for a family was $27,328. Males had a median income of $29,540 versus $17,766 for females. The per capita income for the county was $12,788. About 19.80% of families and 23.20% of the population were below the poverty line, including 30.20% of those under age 18 and 16.90% of those age 65 or over. The Appalachian School of Law (ASL) was started and brought to Buchanan County, Virginia as a tool of economic development for the region. It opened in 1997 and seems to have failed in its intended purpose even after a fortune in subsidies. On January 16, 2002, ASL Dean Anthony Sutin, Professor Thomas Blackwell, and 1L student Angela Dales were shot and killed by disgruntled student Peter Odighizuwa, 43, of Nigeria. When Odighizuwa exited the building, he was subdued by two students armed with personal firearms. At trial, Odighizuwa was found mentally competent, pled guilty to the murders to avoid the death penalty, and was sentenced to multiple life terms in prison. Odighizuwa wasn't even qualified to be there but was admitted to fill a race quota and was pampered by the very people he killed. Because students in this rural community are allowed to carry guns in their vehicles they, not the police, put a stop to this murderer before it became another Virginia Tech style slaughter. Ref. Wiki. The Appalachian College of Pharmacy (ACP), formerly known as the University of Appalachia College of Pharmacy, is a private pharmacy school located in Oakwood, Virginia. The school was established in 2003, opened its doors to students in August 2005. It has received a fortune in illegal subsidies from various state agencies. Under Virginia Law transferring state money to non-profits is against the law, but is ignored by a political system awash in corruption. ACP received from VCEDA alone nearly $2.9 million and has been in operation for 14 years. While they claim this has created hundreds of new jobs, they only created 58 at the school itself and there's no proof it has helped the general population in that regard. They do good work for the community in general and deserve a great deal of credit for that. In fact both ASL and ACP have had no measurable impact on the massive poverty and employment problems in the general community.